At some point in our careers as piano teachers we will encounter piano students who need a different approach than other children. 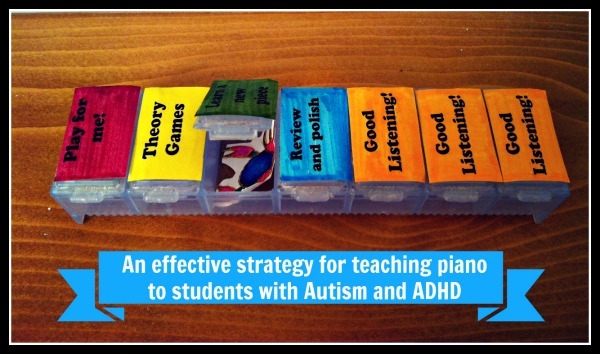 Today we’re going to share a strategy that will have a positive effect on how to teach piano to a child with Autism, ADHD or behavioral challenges. Teachers at my studio recently began teaching piano to two children on the spectrum and, in my efforts to help those teachers structure their lessons appropriately, we came up with this solution that has been quite effective. In the reading we did to help our new students, there was the common theme that children with autism, ADD or ADHD need routines, structure, and consistency, and that they learn best when presented with a visual schedule. Providing opportunities for positive reinforcement for desirable behavior is key. What we came up with was incredibly easy to create and works like a charm! Here’s how to create your own visual aid for the piano students who need it. 1) Purchase a 7 day pill organizer from your local dollar store or pharmacy (see my photo above). 2) Separate your piano lesson into 4 clear parts and find a way to summarize your activities. Mine are “Play for me”, “Theory games”, “Learn a new piece”, and “Review and polish”. 3) Print out labels for each of your 4 lesson parts and add 3 that say “Good listening”. 4) Tape them to each of the 7 days on your pill case (the 4 lesson parts first and the 3 Good Listening at the end). 5) Before your student arrives, “load” each of the compartments with a small, yet enticing sticker. You’ll need to clearly explain to your student how the system works. For each task they complete, they get to flip open the lid and collect their sticker (our students like to add to their collection on the front of their back and forth book). When you “catch” them listening well, they get to open one of the 3 “Good Listening” compartments. The stickers are only given out if you have cooperation for each task. All 3 of the Good Listening stickers may not go out every week. This is really effective for students who need to visually see what is expected of them. Make sure to be fair, and to follow your own rules closely as your student will remember and become frustrated if their expectations for how the visual works aren’t followed. I’ve also used this with students who need help focusing due to ADHD or simply because they are easily distracted or very active. It’s small enough that I can pick it up as a gentle reminder, it’s intriguing enough that my students care to follow the rules and, if I choose the appropriate stickers, it’s really motivating for them. Give it a try! It is sure to make your life easier and your piano students’ piano lesson experience that much more enjoyable. When writing The Adventures of Fearless Fortissimo one of our goals was to appeal to visual learners – to really motivate those students who need more than simply a piece to play each week. Because of the graphic nature of this piano book, and because of the intriguing story line, even my most difficult students were motivated to practice and perfect these pieces. They’re one of the most effective supplementary materials you will ever find!